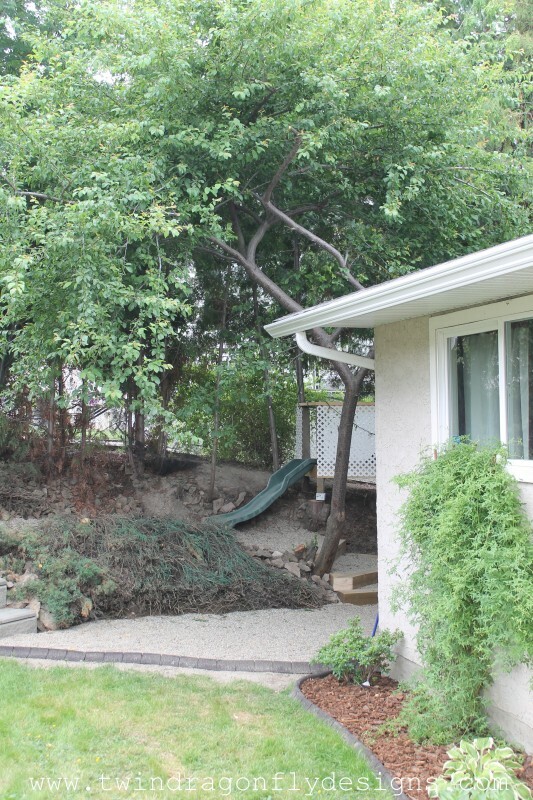 If you visited our backyard tour then you saw the left side of the yard. This is on the right side of our house in a treed area. 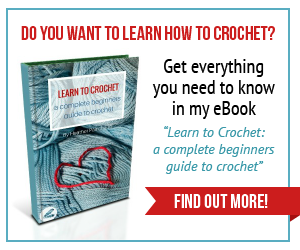 It has obviously been a huge hit with the boys! 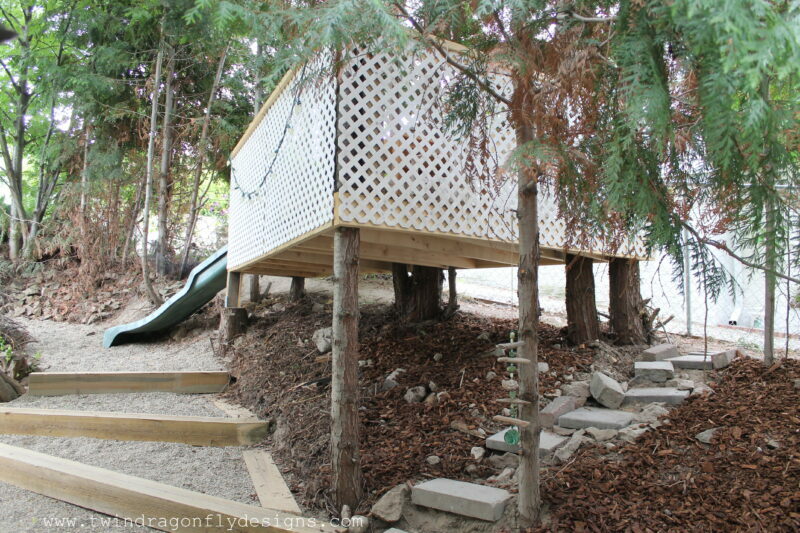 The tree fort resides under a lovely little plum tree which is gorgeous in the spring when it is in full bloom. 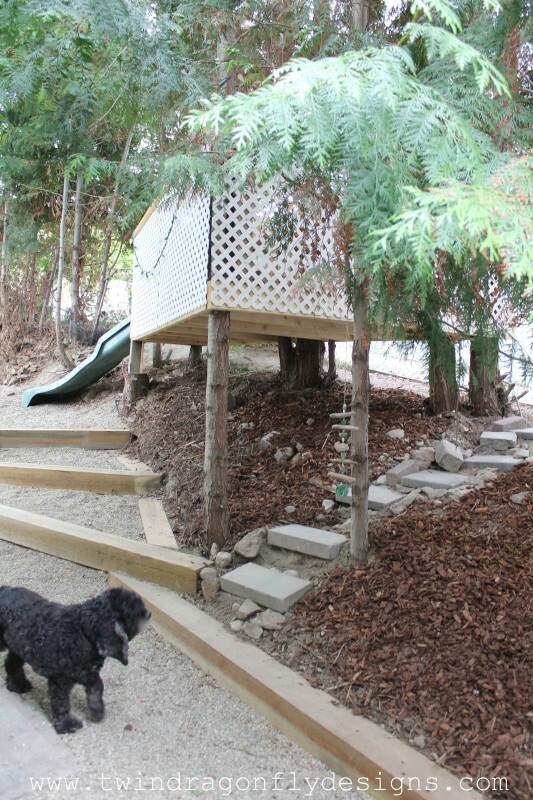 We used extra brown treated lumber from our deck to create the base of the fort and privacy lattice for the sides. 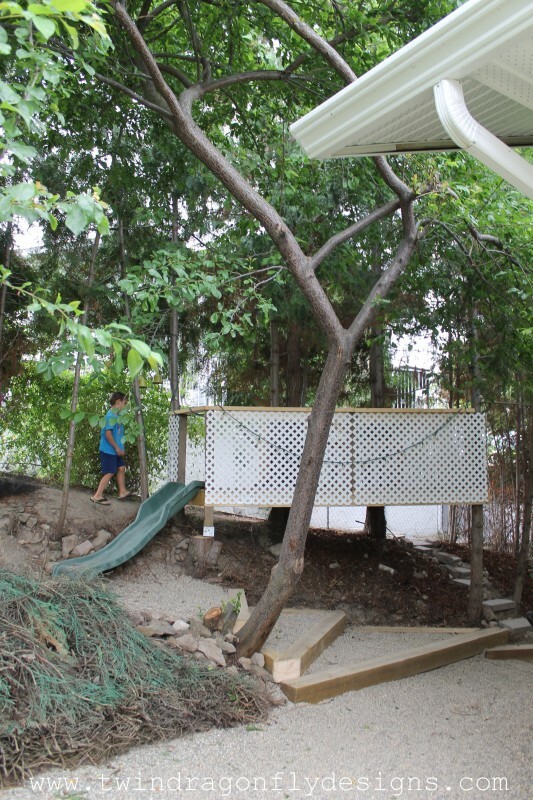 The slide from our old swing set fit perfectly on the lower side of the fort. There is a large cedar bush on this side of the house that is slowly starting to die. We’ll rip it out next year and put in a retaining wall but until then I spray painted it greenish – crazy, I know – but I like to think that it helps the eye to slide over the dying shrub *wink*. 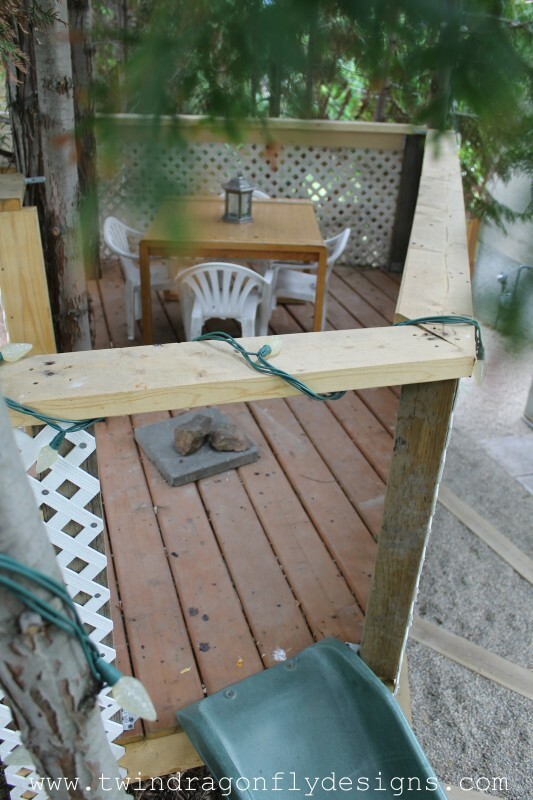 I found a table and some chairs at a thrift store, we strung Christmas light around everything and the boys created a faux “fire” with leftover patio stones and rocks. We would like to put up a roof of some sort to provide protection from the weather and the whole fort may get an upgrade soon if I can perfect my pitch *cough*homedepot*cough*. Cam made these stairs up the hill for access to the fort. He used leftover retaining wall caps and rocks and is very proud of his handiwork. 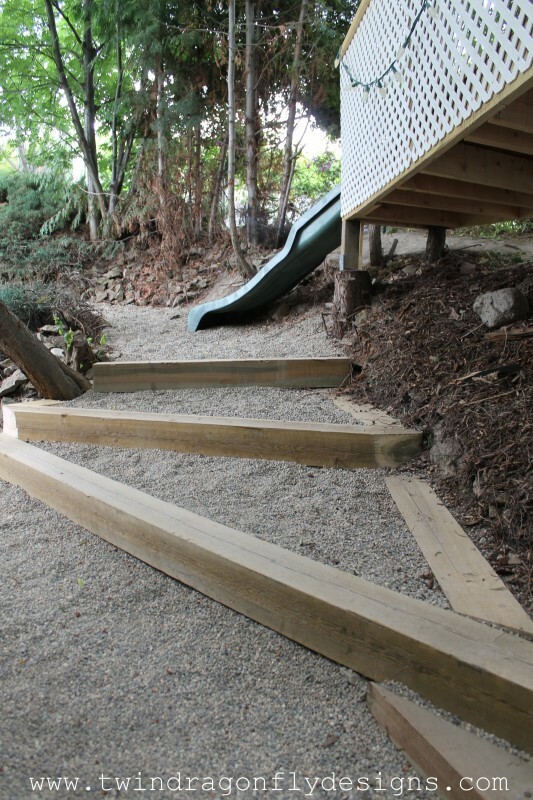 Darcy built stairs up this path using large timbers and pea gravel to coordinate with the rest of the yard. Previously this was a sloped, dirt path. 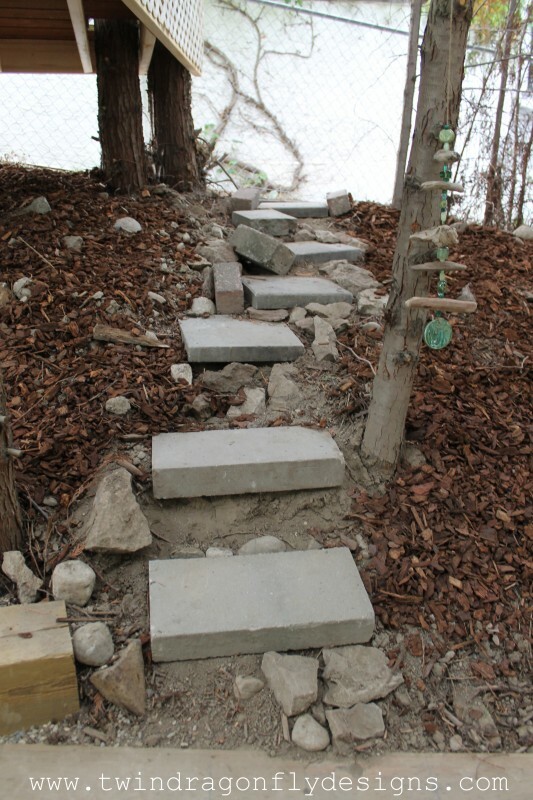 My favorite part of the backyard landscaping – no more dirt! Dirt = mud when you have little boys and pets. I am so grateful to have very little dirt left in our backyard! 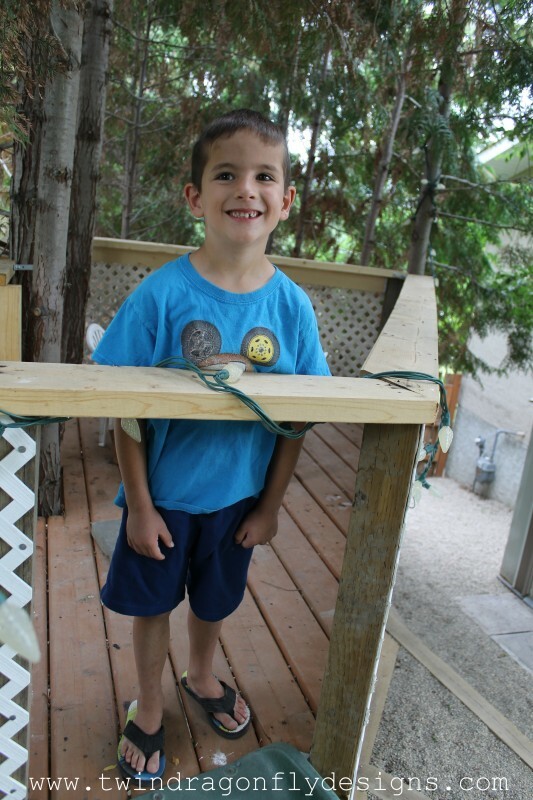 Have you created a fort or tree house for your kids? How did it go? I would love to see it!